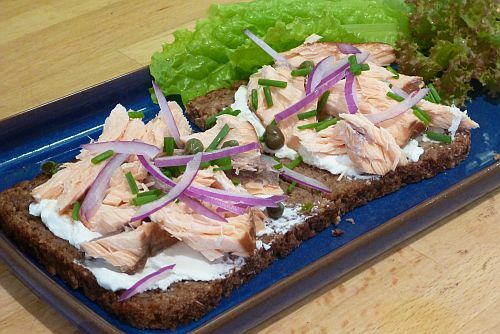 This is so simple, and you can use any hot smoked fish. The original recipe called for mackerel and as we are always looking for more uses of mackerel I have repeated the recipe here. For the photo below I used hot smoked salmon, simply because I had some! This is easy. Spread your bread with a generous layer of cream cheese. Top with flaked fish, sprinkled with a few capers, chopped red onion and chives. With a slad on the side this makes a healthy lunch.